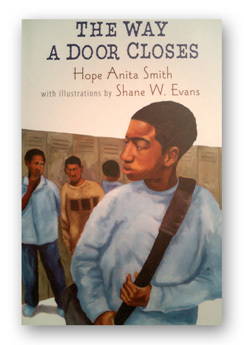 Hope Anita Smith, Henry Holt and Co. Caldacott Award Winner. Ages 9-12. In this collection of thirty-four poems, readers are drawn into the thoughts and feelings of a thirteen-year-old boy as he tries to understand and cope with a parent's departure from the family. Done in warm shades of mostly brown, blue and gold, Evans's full-page paintings have a realistic, slightly sculptural appearance and are a perfect complement to the poems. Good poetry touches the heart and stirs the soul, and The Way a Door Closes does just that.